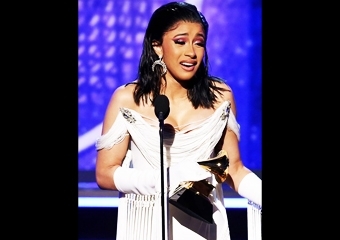 Cardi B became the very first female solo rapper to ever win the Grammy for Best Rap Album solo. Female rappers, both newcomers and established legends, made some of the best albums of the year, and it’s about time the Grammys are finally “stepping up” and recognizing the accomplishments of women in rap. Cardi’s historic win hopefully sets a precedent for women to be major contenders in this category for years to come. Fellow female rappers like Lil Kim, Rapsody, Remy Ma, Missy Elliott, and Iggy Azalea expressed their excitement over Cardi’s win.